As regular readers know, I’ve been spending a good deal of time this election season in New Hampshire, attending and blogging about the various presidential candidates’ campaign events. 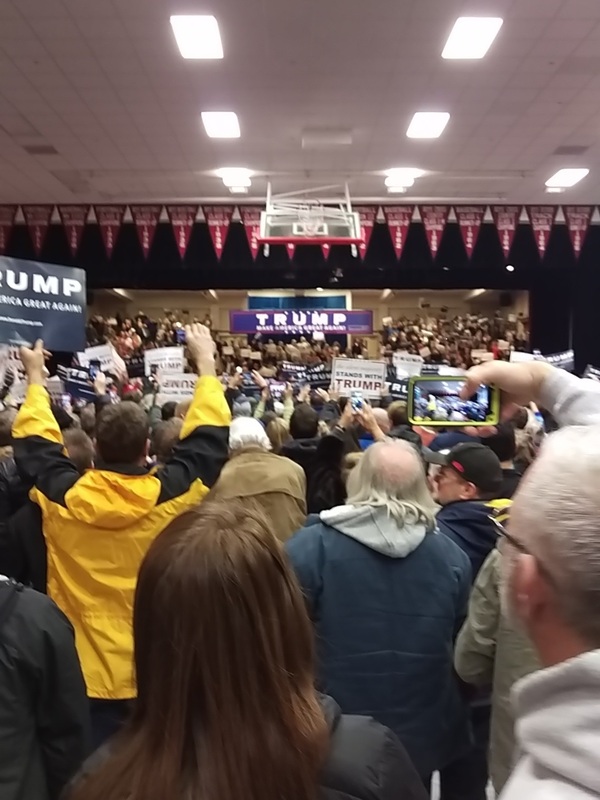 Last Tuesday I finally had the opportunity to attend a Trump event. It was like no other campaign rally I have attended. We arrived at Stevens High School in Claremont, NH about an hour before the scheduled start, only to find a very long line of people snaking from the building through the parking lot and back onto the street. (Security eventually told me they estimated the crowd at about 1,000.) It was a very cold night – in the mid-20’s – and the line moved quite slowly because, as we eventually found out, security was funneling everyone through one checkpoint. Despite the cold, I didn’t see anyone leave, although a woman behind me eventually succumbed to the freezing weather and had to be carried into the event by a Trump staffer. There were a half dozen protesters standing quietly with signs, but they were outnumbered by the vendors hawking Trump merchandise, including hats, buttons, scarves, and banners, all with Trump’s name on it. A group of high school students standing just before us in line must have shelled out close to $100 on Trump merchandise alone. As those in the line passed the protesters, they engaged in a generally good-natured exchange of views. For the most part, this looked like a very pro-Trump crowd. By the time we finally made it through security, it was 45 minutes past the scheduled start time, but Trump hadn’t appeared as yet. (Unlike his Burlington, VT appearance, there were no loyalty oaths administered as the price of admission.) We stood near the back of the gymnasium in which the rally was held, just before a platform that held rows of cameras and media types. I was immediately accosted by an LA Times reporter who wanted a “man in the street” interview with a real Trump supporter, but I told him he should talk to a N.H. resident. Here’s what our view looked like. After dealing with the polls, The Donald spent the next 50 minutes riffing on an amazing range of topics, including immigration (“We weren’t even talking about illegal immigration until I brought it up….the other day one of the candidates said ‘we’ll build a wall!’”), trade (“I’m taking our jobs back from China”), the Iran nuclear deal (“one of the most insulting transactions I’ve ever seen… and we don’t even get our prisoners back”), gun control (Obama’s executive order on background checks is “no good, it’s not fair, and they’re not going to screw around with the Second Amendment”), ISIS (“bomb the oil, take the oil…just take it”); Iraq (“I said don’t go in”), infrastructure repairs (“I build buildings…under budget, ahead of schedule”), veterans (“We’re going to fix the Veterans Administration”), Obamacare (“it will probably crash in 2017”), foreign policy (“We’re tougher than all of them, but we need to be smart”), gun-free zones (“gun-free zones on a military base? That would end day one [of Trump’s presidency]”), and Putin (“Wouldn’t it be great if we actually got along with Russia?”), to name some of the topics. It became immediately apparent why so many people find his candidacy appealing. Trump speaks bluntly, yet in conversational tones (“We can be nice and politically correct, but we don’t have time for all that”), barely glancing at notes, and presents his positions at such a generalized level that it is hard to raise objections. Most of his statements were met with cheers and even applause by the packed auditorium. All the while he would intersperse his discussion of policies with personal shots at the other candidates. “Hillary Clinton doesn’t have the strength or the stamina.” Jeb Bush is “down in the polls, he’s not doing too well” and later “this guy’s got no energy!” Referencing the Iran nuclear deal: “John Kerry did not read The Art of the Deal!” Even journalists attracted his ire – “they are bloodsuckers…they are so dishonest!” But not everyone earned his scorn – Trump went out of his way to praise Tom Brady, Bill Belichick and Patriots owner Robert Kraft. At one point someone in the audience cried out, “You’re a winner!” Trump replied, “Oh, I love you.” And then, “I love Tom Brady. Do we love Tom Brady?” he asked, evoking huge cheers. “Maybe that’s why we’re doing so well in this area….Tom Brady likes Trump and I like Tom Brady!” Apparently The Donald likes winners – particular those from New England. At one point Trump noted that he had decided to buy advertising, spending about $2 million a week (“But it’s my money!”) even though he felt “guilty” for doing so. He justified the expense by noting “I don’t want to take any chances!” Trump also addressed critics who thought his polling support wouldn’t translate into votes. The debates are getting “the biggest ratings in cable history” because of my participation, he boasted. Trump predicted that if he ran against Hillary Clinton in the general election, his presence would boost turnout to record levels – “the greatest turnout in history”. 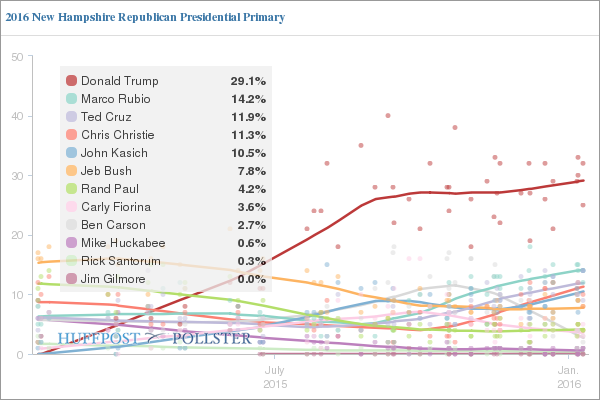 Periodically Trump would return to rave about the polls. “One of the things that came out in one of the polls…No one is ever leaving me!” he marveled, referencing polls that showed his supporters would not think of voting for someone else. (Evidently he doesn’t include his ex-wives in this category.) “I love my people! They’re the most loyal!” He also acknowledged why he gets such extensive media coverage – “It’s called ratings!” – and implicitly acknowledged the link between that coverage and his strong polling support. Despite the often cartoonish way in which journalists portray him, Trump has a deep understanding of how to make sure the media focus stays on him and his ability to remain the center of media attention is the key to understanding his strong showing in the polls. I had seen much of Trump’s speech in segments before, but he tailored aspects of it, such as the references to Brady and Belichick, to his New Hampshire audience. He raved about the beautiful homes in the area – “This is a nice area…like a magnificent painting….but if somebody walks into those houses, bing [here he pantomimed shooting a gun] it’s over, right?” before launching into a defense of the Second Amendment. But he also acknowledged the regional opiate problem – “I’ve never seen a place where the first thing they talk about is the drug problem” – and said the solution was to prevent drugs from coming into the area. Trump seems to understand the source of his appeal. “There’s anger in our country,” he said at one point, “But it is a positive anger….I’m not catering to anger….the people are smart.” He also was incredibly adept at playing to his audience. At one point he referenced how Hillary Clinton’s campaign events were scripted, and that she disappears between events. “Where does she go?” he asked rhetorically, to which an audience member screamed, “To the bathroom!” Trump feigned indignation, proclaiming: “That’s terrible…throw him the hell out of here” while the crowd laughed. During the Q&A session at the end, he allowed one audience member (“he’s a handsome guy!”) to come on stage to take a selfie. When he was finished speaking, and somewhat to my surprise, Trump announced, “Let’s take a risk and open it up to questions.” He took three questions, shouted out from the floor without a microphone, dealing with women serving in the military (Trump asked the audience what they thought, but then never took a position); term limits (“terms limits are fine with me”); and voter fraud (“You have people in my opinion voting many many times”). 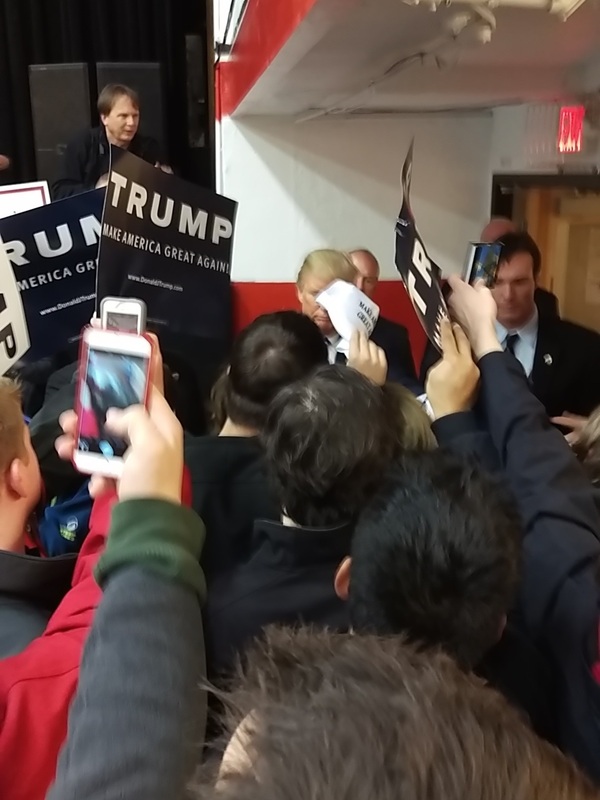 After exiting the stage (to Twisted Sister again) Trump waded into the crowd where he was mobbed by people wanting pictures with him. To be sure, Trump retains a healthy lead in the aggregate New Hampshire polls; at 29%, he more than doubles his nearest rival Marco Rubio’s support. But the situation remains volatile less than a month out from the February 9 primary date, with many New Hampshire voters yet to make up their minds. It remains to be seen how much of the 70% not supporting Trump will coalesce behind one of his rivals. If they do, we’ll be there to report on it. Stay tuned! It’s going to be yuuuuge! Nice writeup, thanks. It will be interesting to see how Iowa changes it, if at all, and whether there is an Independent play at the end, but Trump is way way ahead. Matt, great to see you get ahead of the curve and make the Trump call in NH. Well, thanks, I guess – except I never actually said he was going to win in New Hampshire! But why fight a good story…..
Great cover. And we know how he has been doing since this was written. The WALL is going to be yuuuuuuge. Until I went to his rally, I didn’t fully understand how passionate his supporters were. After attending, I’m less surprised that he won the nomination. But the general election is going to be a much higher hurdle to clear.